Every parent arrives at that moment when they have to send their child to preschool, whether that’s kinder, day care, occasional care, home care or creche to name a few. It’s heart wrenching, to say the least, and often the first time that both parent and child are away from one another for an extended period of time. Having experienced this herself as a full-time working mum with few other alternatives, Lizzie really struggled sending her boys to preschool from a young age. She worried if they were happy and enjoying themselves and carried a constant feeling of guilt. That was until she realised that her perception of their experience was completely wrong. Lizzie's awakening came when her eldest son Bailey started to call his preschool teacher Toria Ubbles (aka Victoria Bubbles), because of the beautiful bubbles she would blow ever morning when he arrived at preschool. Lizzie came to see that he loved Victoria and had so many memorable adventures with her. This inspired her to write Victoria Bubbles and the Great Preschool Adventure, a magical story that parents and carers can read to children starting or attending preschool, which would help to open up the dialogue about this pending change and also give parents a feeling of confidence and peace of mind about preschool. 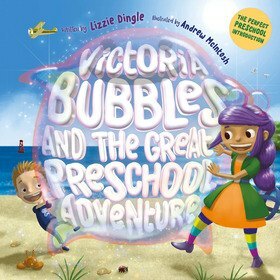 Victoria Bubbles and the Great Preschool Adventure is seen through the eyes of the children. Children have vivid imaginations and see much more magic in everyday life than we do as adults. This book was created with love, for every preschooler and their parents.